Our CBD Edibles contain pure CBD Oil obtained by a rigorous and trusted process. Our CBD Edibles are available in different flavors, strengths, and designs. Includes sweet & sour gummies, watermelon, worms, and rainbow bites. 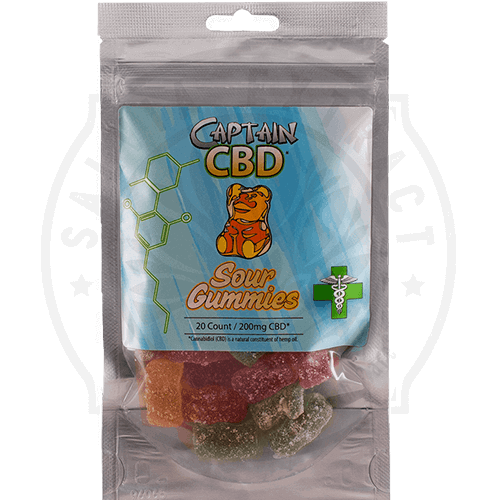 Produced by The Captain, a leader among the CBD Product Suppliers. A fun and discreet way of taking CBD anytime and any place! Same day and Free shipping are always available to our valued customers. Satisfaction Guaranteed. The emergence of high cannabidiol (CBD)-marijuana strains and CBD-rich medicinal products over the last 20 years has led to an explosion in the medicinal use of cannabis. CBD is a non-psychoactive phytocannabinoid found in cannabis that is thought to convey many of its medicinal benefits. Benefits such as anti-anxiety, anti-inflammatory, and pain relieving are just a few. CBD is known to relax the body and is excellent for relieving stress and anxiety, naturally. CBD edibles are a convenient, fast, and very discreet method of consuming CBD.